-- RCAF Flight-Lieutenant John Gillespie Magee Jr.
At the time, reader, America is involved in a Cold War with the Soviet Union and then further embroiled in the beginning quagmire of near, middle, and far eastern war. Korea. A new type of conflict has been going on above the battlefields in the ironic "land of morning calm." One might predict it would not be a better one. See, this war, unlike any before it, involves a very different type of conflict currently perpetrated to preceding... ...almost quaint attempts. These include a new type of fighter aircraft. Turbine powered jets are the terrible original thing. A new plateau of medieval savagery is reached. The aerial struggle between the Soviet MIG-15s and American Air Force jets were a novel kind of "grueling and deadly." Does the reader recall the lurid tales of "MIG Alley"? Stories pale to reality's existentiality. Stateside, these new Air Force and Navy fighters are spring-loaded around the continental US in anticipation of a Soviet nuclear air strike. A newly formed Ground Observers Corps, sky-watchers 200,000 strong (volunteer civilians across the entire country), assisted the Air Force in monitoring the skies... on the lookout for Soviet bombers. This writer's mother was in the GOC and still has her awarded "Observer" Wings. See, during this time, the radar network throughout America was decidedly insufficient and there were many defense "holes" across the country, especially under the 5,000-foot elevation. Something had to be done. Yes, there was a great deal of public awareness, real pressure on the United States Air Forces during this time. Still, at this precise moment, oddly enough, another vast problem had cleared an evidentiary horizon. This other and very highly strange problem complicated matters even further and had nothing to do with Soviet bombers. Question. What else might be seen and reported by the GOC? For reference, Blue Book chief, Captain Edward Ruppelt informed, "If you can pin down a date that the Big Flap started, it would probably be about June 1." 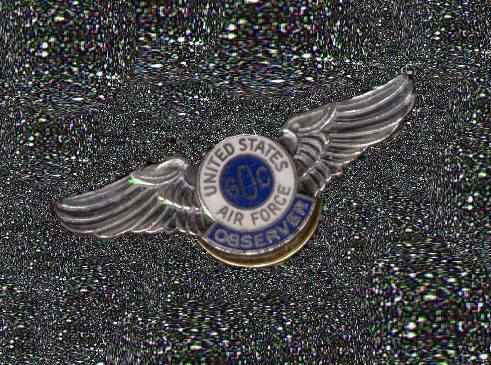 Now, during those summer months of June, July, August, and September, the USAF received a staggering, 1,134 UFO reports. Eventually, an updated Blue Book evaluated 303 of those sightings as "Unknowns." The music remains to unsettlingly echo. 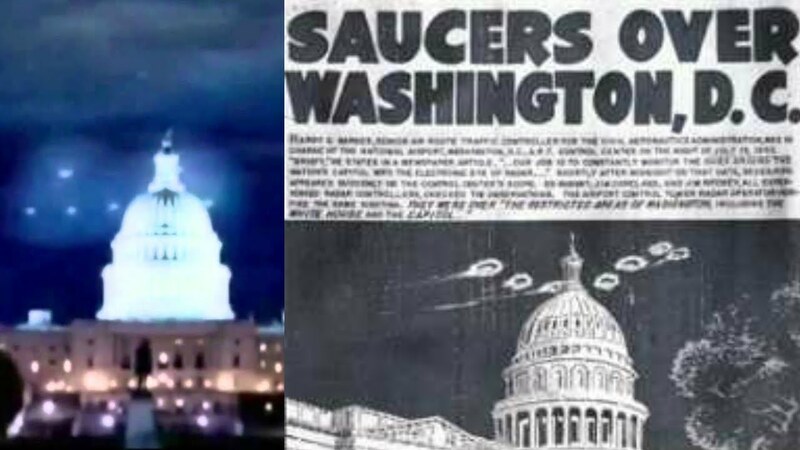 Now, enter two of the most well-known UFO incidents in American history occurring over and near Washington, DC. These occurred on the consecutive weekends of July 19-20 and July 26-27. On those two weekends, UFOs wreaked holy havoc with the Air Force near the Capitol, prompting the Air Defense Command to scramble fighter jets in an attempt to intercept them. On July 28, 1952, the Washington Daily News reports a follow-up story in its article, Jets Ready to Chase Lights-24-Hour Alert Ordered After Second Appearance Here. It summarized, "Jet interceptors of the Eastern Air Defense Command are on stand-by-round-the-clock orders today [July 28] to take off immediately if any more mysterious lights show up in the sky or on radar screens." More menacing music, reader. On the following day, July 29, additional information was released to a jittery American public with regard to the "growing flying saucer problem" across the country, revealing how the Air Force was handling the problem. To some, it was comforting to know that our Air Force was protecting our country from intruders, but to others it was an outrageous and disturbing, forget horrifying, revelation! 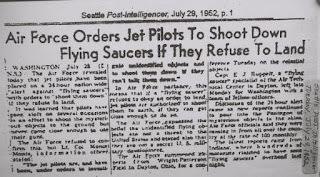 The Seattle Post Intelligencer reported in their headline from an "International News Service" release, "Air Force Orders Jets to Shoot Down Flying Saucers If They Refuse To Land." A USAF Senior Public Information Officer revealed the following on July 28: "Lt. Col. Moncel Monts, Information Officer stated unequivocally, "Jet pilots are and have been under orders to investigate unidentified objects, and to shoot them down if they can't talk them down." The music intensifies threateningly. 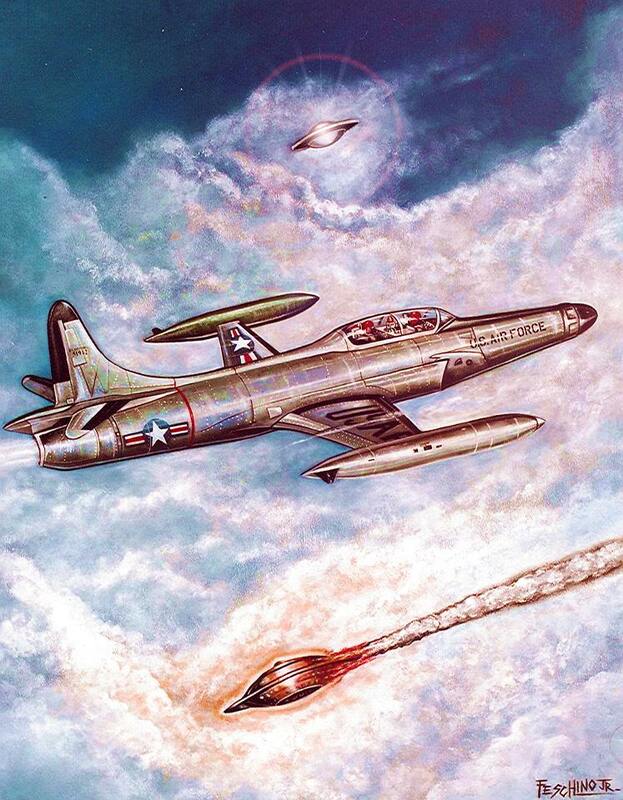 The San Francisco Examiner reported the "International News Service" release information in their July 29 article: "Jets on 24-Hour Alert to Shoot Down 'Flying Saucers.'" 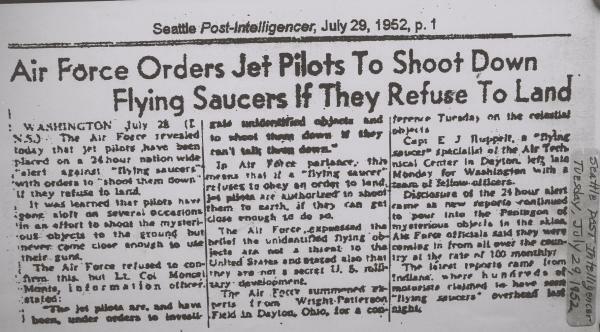 It stated, "The Air Force revealed today [July 28] that jet pilots have been placed on twenty-four-hour nationwide 'alert' against 'flying saucers' with orders to 'shoot them down' if they refuse to land." Harsh musical climax, like a blow! This is fact. The music can fade, for now. Back to you, Pilot, a crackerjack jet-jock and honest-to-God air warrior able to trespass on the sky's hallowed halls; you're excellent at your craft and bear out all the expectations of peers and superiors alike. Just this moment, almost, you've been signed off as worthy enough to helm the business seat of America's cutting edge and state of the art fighter jet, the F-94 Starfire. 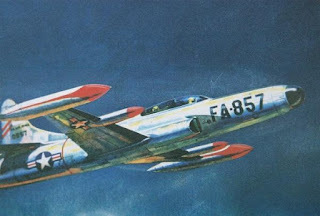 This blowtorching winged cigar, looking like a beginning meld of the 20th and 21st Centuries, was an edge-of-the-sonic-envelope attack dart which could be bristling with rockets entirely able knock out Soviet bombers with single punches, at least four 50 caliber machine guns for lesser mayhem, some new far-reaching sensory avionics, and a first ever computer assisted targeting system. Yeah. That far back. A craft for beginners? No, it was top guns who were trusted with this airplane, friends and neighbors. Make no mistake about that. A million dollar airplane is a million dollar airplane and difficult to grow on trees. This one went over four million in today's dollars. Currently, you're on standby alert at a coastal base in Florida named, oh... Tyndall, perhaps. Why? Revealed by one Frank C. Feschino, Jr., author of the well regarded books and papers extant on the subject of this essay, America, and assuming collaboration with like-minded friends and allies, decided as mentioned above that it would be in America's best interest to shoot down all unidentified flying objects refusing to identify themselves or even make contact with authorities in the air. Hubris can sometimes know zero bounds. 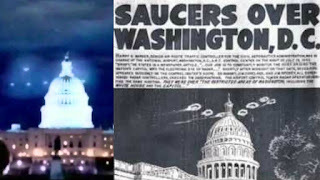 As the reader now knows, the history of that time shows the summer of 1952 sporting a well reported, if inordinate, amount of UFO activity, everywhere, but essentially and especially over restricted areas in Washington DC, to include even the White House! This was, again, the "Summer Of Saucers" flap of your year, Pilot, reminding the reader that it was the biggest one of our history, hands down. Standing orders became authorization to shoot down uncommunicative UFOs, remember, wherever they were detected... at all cost to man and machine as we shall see; we wanted one of those things... badly. Suffer a brief history lesson now, reader. Pioneer UFO researcher, Combat Aviator, military aide to Charles Lindbergh, and popular author Major Donald Keyhoe, who worked closely with the Air Force in gaining information about the saucers, wrote about UFOs in a few of his books. In his 1960 manuscript, FLYING SAUCERS-TOP SECRET, Keyhoe revealed the following about an Air Force statement made in 1947. "On June 27, the Air Force stated," Keyhoe informs with regard to a heard testimony from top military officials, "...'We have no idea what they are.'..." Keyhoe continues, "[I'm] seriously concerned they ordered their pilots to down a UFO for examination by shooting them or by ramming them and then bailing out." Jay, Joe, and Marigold! See, in Keyhoe's 1955 book The Flying Saucer Conspiracy he explains, "In 1949 the Air Force told me that they had been ordered to 'get' a flying saucer by any possible means. This was admitted by an intelligence officer at the Pentagon, Major Jere Boggs. 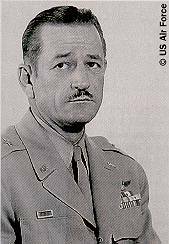 In front of General Story Smith, Boggs told me that one Air Force pilot had fired at a saucer over New Jersey." All Keyhoe's reports were from first-handers well inside. 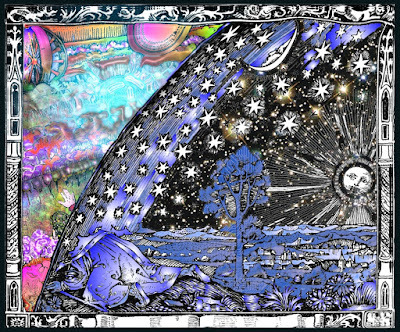 In one of Keyhoe's later books published in 1973, Aliens From Space, Keyhoe discloses even more startling information from his 1949 meeting at the Pentagon. He makes known another stunning quote from Major Boggs: "We were naturally anxious to get hold of one of these things. We told pilots to do practically anything in reason, even if they had to grab one by the tail." Ramming doesn't seem so entirely out of the question. During the famous July 29, 1952, Flying Saucer Press conference held at the Pentagon, Major Gen. Roger Ramey, USAF Director of Operations, confounded, confabulated, and confused the press with his double-talk in the form of "temperature inversion" explanations. 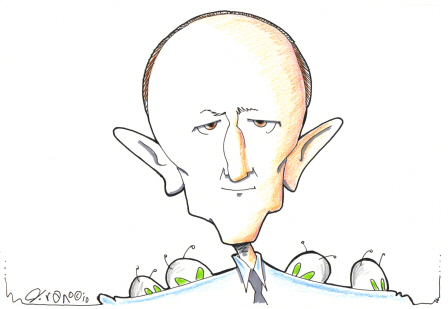 This was a disingenuous attempt to dispel the public's growing fear of flying saucers. Sure, lie to the public. That always helps. 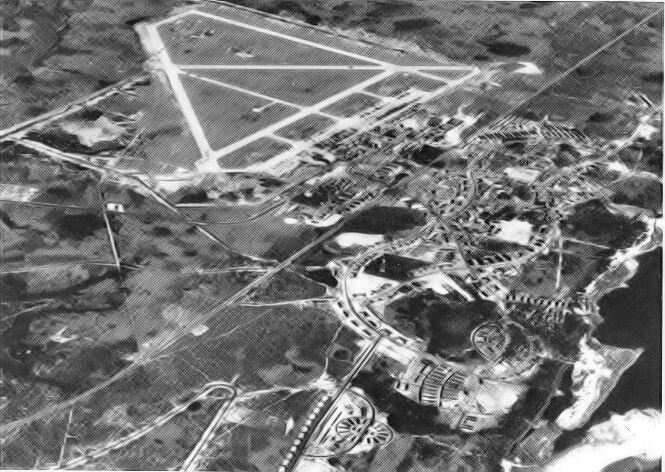 Additionally, in an unsettling half-turn on July 30, it was reported by the Louisville Courier-Journal in its article, Radar Spots 'Saucers' Over Washington Again, that "Major General Roger Ramey, Deputy Chief of the Air Force Staff of Operations (sic), told the news conference that interceptor planes had raced aloft several hundred times as a result of reported sightings of unidentified objects. He said, that was standard procedure." ...For temperature inversions? Justifiably, Air Force jets chasing after UFOs with the possibility of intercepting and shooting one down did not sit too well with some people. This was especially true with one man in particular, the esteemed Robert Farnsworth, the President of the United States Rocket Society. Next: Farnsworth recoils in horror and makes a heartfelt plea, Outrage and Incredulity, Numerical justifications and red flags, ...and your air alert gets called.